Katie Haarsager is a public information officer for the North Dakota Industrial Commission – Department of Mineral Resources, a role she’s held since May of this year. She’s a Mohall native. Let’s learn more about Katie our December Service Team Spotlight! Why do you feel it is important to be part of the YP Network? 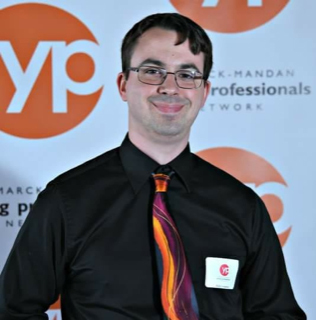 I’m new to the Bismarck/Mandan community and believe the YP Network is such a great avenue for meeting new people, exploring what a new town has to offer, and becoming woven into that town’s social fabric! Are you involved in other organizations in the community? If so, to what extent and why is this important to you? I joined the Bismarck/Mandan Garden Club and the Sons of Norway! If anyone is interested in helping me bring the average age of these groups down a little more, let me know! Heritage and traditions are important to me, so Sons of Norway was a draw as I come from a very Norwegian family. I grew up on a farm so gardening is something that I love to learn more about, especially soaking up all that knowledge from those who have done it far longer than I have! What professional advice do you have for other young professionals? Put your phone down, make eye contact, and truly engage with those around you. Make sure your circle is always expanding and never contracting. Meet new people, say hello to those who look like they want to belong but don’t know where to start, you never know what you might learn from that interaction! How do you spend your free time? I have a dog that requires oodles of attention! We can be found walking by Cottonwood Park or playing fetch at the dog park in Mandan. Thank you, Katie, for sharing such great insight! We’re so glad you’re a YPN member! Billy Longmire is a great example of how getting involved in various YPN teams can help you grow personally and professionally. His involvement in the YPN’s social and service teams has led to friendships with fellow members who share career development ideas, public speaking engagements, and the discovery of community organizations for which he’d like to volunteer. Billy has been a lead medical support assistant at the ND Department of Veterans Affairs since 2013. He calls Horace, ND, home, but his birthplace is many miles away in Hanau, Germany. Why do you feel it is important to be a part of the YPN? I enjoy being a part of the YPN because it allows me to network and socialize with a group of people who have similar interests and goals in mind. I work with mostly retirees, so even though I can learn a lot from their past experiences, it is nice to have a conversation with people my age who have similar goals and aspirations. I like attending guest speakers to see how they created their own path – their life’s vision, the weird twists and turns their journey took, and how it led to where they are now. I really enjoyed talking to BHS students about my own journey. I never thought I would be where I am today, and it was fun to share stories about my past and goals for the future with students. As professionals, we sometimes get caught up in our day in and day out activities that we forget to look back and appreciate the journey and accomplishments along the way. From a young age, I have always enjoyed volunteering. I started as a Special Olympics bowling volunteer, and when I got to high school, I volunteered in numerous capacities as a member of my school’s National Honors Society. Now as an adult, I volunteer with ND Autism and the YPN. It is very rewarding to be able to give back and see how you can touch people’s lives with small gestures. The YPN has helped me to find different avenues to volunteer that I might not have found on my own. Overall, the YPN is a great place to help professionals find what they’re looking for. I believe if you are goal-oriented, have a passion, or just want to try something new, you can probably find something that you are looking for to benefit you as a person within the YPN. Are you involved in other organizations in the community? If so, to what extent and why is this important to you? I am involved with ND Autism in Bismarck. I’ve volunteered for game/sporting event days, meetings, the Light it Up Blue event, Autism Awareness Walk, and holiday parties. I enjoy working with youth and seeing how you can impact their lives. Don’t be afraid of failure. If something interests you, try it! I reflect on an old commercial often about how people never regret the things that they have done, but always seem to wonder what if for the things they never tried. Empty out that bucket list and make it reality. We only get one shot at this thing called life. Oh, and I should take my own advice sometimes. I enjoy staying busy. I work on home or construction projects with friends; attend local high school and college basketball games; hang out with my friends who have turned into family; support my friends’ kids by going to their choir, drama, or athletic activities; and volunteer with the YPN. Fun Fact(s): I’m going to be an uncle in November! Photo cutline: Billy Longmire. Photo by Lee Greuel, LG Photography.